Visibility/Location: Once we arrived in Downs it got a little confusing, from the information provided to Haunted Illinois, we were asked to purchase tickets at Dooley Park. Dooley Park was dark and closed due to road construction and I finally saw a small sign that stated tickets need to be purchased at the Haunted House. I knew where the house was because of visiting before and once seeing the house there were a few actors outside; but no lights or signs to lead the way down the street. 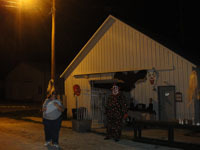 A patron traveling outside the area would have difficulty finding the haunted house. Parking was hard to find due to some streets being blocked off for the haunted house. There were no signs instructing where to park so we chose a side street to park on. If you are coming from Interstate 74 there is a sign on the main road that directs you to a parking area. Wait Entertainment: The patrons were greeted by 2 chainsaw wielding goons that stirred up the scares with the patrons in the line. Off to the right of the line was a small scenic graveyard. They have an unlimited wristband option for $5.00 per night. Crowd Control: This is a guided tour with one guide in the front and one in the back. Since this was their opening night the crowd was light, I was unable to really get a feel with how they would have handled a large crowd. All I can say is that my group was the only group in the house at that time. Downs Haunted House seems to change up the route of the haunted house each year which is always nice to see. The building is an old garage that was donated. We walked up to purchased our tickets and found out that there was not a hayride, nor refreshments, or a bon fire at Dooley Park due to the road construction was still going on. The ticket seller said that everything should be on track to be open the following Saturday, October 12th. The ticket taker was dressed in all black and did not standout at first until she got close to you and you noticed her face. Her make-up along with latex was done to add many wrinkles to her face and her eyes were completely black, a nice touch. One of our guides was dressed in street clothes with a mask on the back of his head and the other was dressed in all black. Once you entered the house you were led up a ramp and told to watch your head because you were basically at the top of the building and then walked back down a very steep ramp. The guide in front and the guide in back communicated throughout the tour with each basically asking is everyone still with us. This distracted from the attraction because they were using their normal voices. I am not sure if this was to trigger the actors or not but the scares were not coming until the group actually stood still in front of a scene. The guide told me that I would have to crawl at one point and soon as I stooped down I got an overwhelming smell of sewer. As you crawled through sheets hanging from the ceiling of the crawlspace you wanted to try to hold your breath to detour the smell. I was relieved to find out they were using a scent maker to get that smell after over hearing a patron asking the ticket taker about it. As we walked through a strobe lit black and white room we came upon an area of lost, unwanted dolls. The detail in this dimly lit area really caught my eye. Morbid dolls, some missing eyes, and limbs covered the wall and hung from the ceiling. This would have been a good area for a scare but they seemed to be light on scares and actors. The use of pitch black halls twisting and turning really seemed to make the building seem bigger than it actually is. The circus room was an audience participation room with games for patrons to play. Patrons could play the games for a chance to win prizes that really no one would want. Add in a creepy clown that was constantly saying he was hungry really added to the creepy atmosphere. Another scene was a constructed forest with a hunter cooking up some body parts. She was not sharing her campfire food and that was fine with us. She kept our attention on her for this scene to make sure we had no idea what was in store for us. Once you were at the end of the attraction it just ended. There was not a grand finale which felt strange since that is a great chance for one last scare. I basically walked out the exit into the street. Actors did a really good job to remain and stick to their characters while inside the house. For their opening night patrons were light due to the road construction that blocked roads and kept Dooley Park closed for the family activities. There was also a high school event which took some of their actors and patrons away. Downs strives to make it a family event and I would have to say from past experience it is a really good value for spending an evening out with the entire family. Starting next weekend they will be serving chili, hotdogs around a bon fire, entertainment, and a hayrack ride to and from the haunted house starting at Dooley Park.